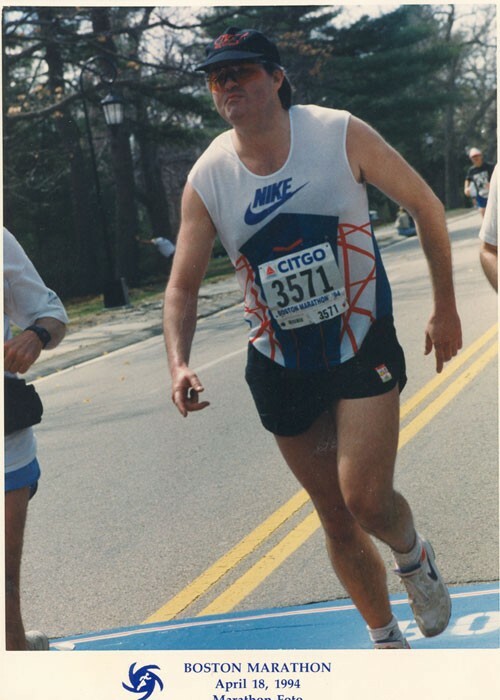 After completing the 1993 Boston Marathon, the L Street Running Club asked me to write an article for their newsletter about my experience at the event as a blind runner. So I am sharing it here following some further observations. Observation #1: It’s funny to look back on an old article where one says “looking back” in the article. So looking back on looking back. Hmmm. Observation #2: You must wear something that the crowd will notice and enable them to shout back at you. I had the words “Vision Quest” on my tank top and lots of people shouted stuff at me like “Go Vision Dudes!” or “Go Questmeisters!” You need to hear stuff like that as you go along. Observation #3: Looking back, I remember more of the days spent preparing for the challenge than I do the actual 4 hours running the race. It’s just a matter of scale. Observation #4: When you finish, you will be standing slightly dazed, some yogurt dripping down the side of your mouth, your mylar wrap flapping in the breeze like a feather boa, and someone will ask if you are running it again next year. Please don’t laugh too loudly at them! Back in October, when I first discussed the idea of running it with my friends, the Boston Marathon seemed like an obscure and far distant notion. But as I trained, spending hours each day running and lifting weights, I came to realize that the marathon is a goal, something to aspire to. It wasn’t always easy to focus in on that goal when it was pouring with rain and a cold gale wind is trying to push you backwards along the stretch between the Landing and Castle Island. But that’s part of the deal; overcoming obstacles. 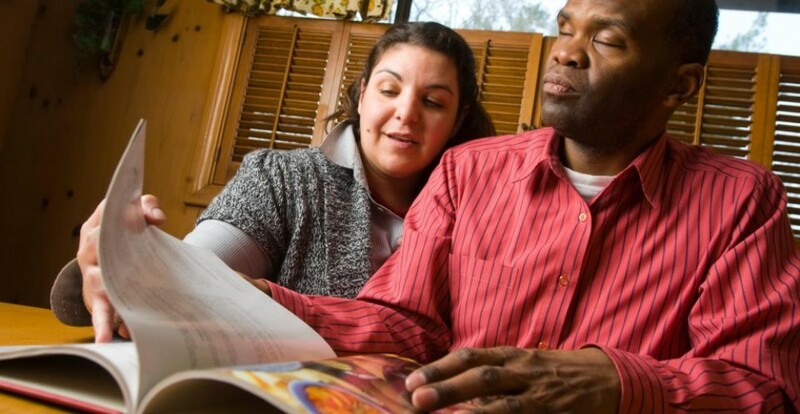 Being visually impaired I’m used to facing obstacles and overcoming them. Some of the biggest obstacles to overcome aren’t physical at all, they’re the doubts within yourself and the misconceptions about yourself. While these challenges are difficult to overcome, they are the most satisfying. Training for the marathon instilled me with a stronger sense of discipline, self-control and confidence. Having said that, I will also say that I couldn’t have finished the race or trained for it without a great deal of support and encouragement from many friends. That’s also part of the marathon experience. We set up a team of sighted guide runners along the race route who ran a relay with my cane as the baton. Most of the relay runner escorts enjoyed themselves so much that they’re talking about running the entire route next year. I was also very gratified by the camaraderie between all the runners out there. I was concerned that I might be a hindrance. On the contrary, runners came along side of me and told me I was “inspirational.” I just smiled, it felt great. The crowds along the route were also a major factor in helping me finish. I’ve never experienced such a sensation. Thousands of people exhorted me onwards. Occasionally, a friend in the crowd would spot me and my pace would quicken, especially when we passed through Wellesley College. Those women sure can keep a guy moving. I’d especially like to thank the girl with the garden hose who doused me with cold water when it seemed that the hot sun was going to hammer me into the asphalt. It’s an amazing feeling to have more people cheering for you than most professional athletes will get in their entire career. It lasted for the entire route and made the time pass by much more quickly. The sensation of turning onto Boylston Street is unlike anything else. There was nothing left in me and yet there I was running towards that finish line. I undid my cane. The p.a. system announced my name as I neared the end. My friend Steve turned to me and said “let’s sprint this last bit”. I looked back at him and said “I am sprinting!”. I crossed the line. Is that it? Is that the end? Hardly. Looking back on it all, I know that I’ll never forget my first marathon. It’s so many different sensations and emotions tied together. The race leaves you looking forwards so I know there’ll be more to come. I’m going to tackle many other challenges and obstacles with a new enthusiasm. Those 10K’s are going to be a breeze now. I’m ready for the summer like I’ve never been before. So thank you Susan, Mark, Bill, Mike, Steve, Linda, and everyone else, we’re all in this together. I’ve come to realize that while my eyesight might be poor, I have excellent vision! Follow Peter on Twitter at @Midnight_Golfer, on Facebook at facebook.com/PAStheMidnightGolfer, or on his website, peteralansmith.com. Now in its 23rd year, Team With A Vision will be running the 2016 Boston Marathon. Learn about this year’s Team and support their efforts at mabvi.org/teamwithavision. All donations go towards MABVI’s life-changing professional, peer, and support group services for the blind and visually impaired. This entry was posted in Running, Uncategorized and tagged blind, Blindness, Boston, Boston Marathon, College of Charleston School of Business, Disability, Harvard, humor, inspirational, John Hancock, L Street Running Club, Low vision, MAB, MABVI, massachusetts association for the blind and visually impaired, Peter Alan Smith, running, South Carolina Commission for the Blind, Team With A Vision, The Midnight Golfer, TWAV, vision impairment, Vision Loss, Visual impairment, Visually Impaired, Wellesley College by mabvi. Bookmark the permalink.